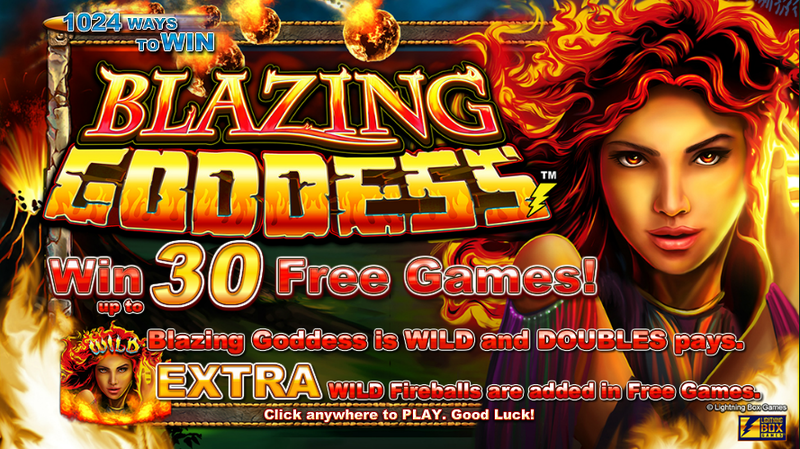 Blazing Goddess features 1,024 ways to win and a fiery theme, but does it deliver? Lightning Box games may not be the biggest developers around but they certainly do try. Their games usually have some pretty awesome iconography and cool aesthetics that immediately draw the eye. However, they often develop games that look, sound and feel good but are, ultimately, pretty shallow. Blazing Goddess, sad to say, is no different in this regard. With very minimal features, below average RTP and payouts which can only be described as mediocre. We'd go as far to say that this game is almost not worth playing at all. But is there anything about it that could redeem it? We find out in this mobile slot review. When you look at the logo for Blazing Goddess, your eyes are immediately stunned at the gorgeous lady with fiery hair on display. Most of the game stays true to this look with a Polynesian theme that remains consistent throughout (though it is odd that the goddess herself doesn't look Polynesian). This offers up an incredibly colourful game that's not too sore on the eyes. The animation is smooth and top quality, featuring a soundtrack that is appropriate to the theme. The game also boats 1,024 ways to win. As mentioned in the introduction, however, the features of this game are extremely lacking. The most exciting thing they can even call a feature is the fireball wild symbols (which we'll go into more depth with in a moment) but other than that there's really not much else to talk about on that regard and that is really disappointing. At least the game is mobile-friendly and works on most devices. The one thing that can be commended for Lightning Box games is that this game's theme is pretty consistent and well done. Apart from the rather unfortunate and questionable race of the goddess herself (if she's a Polynesian goddess, why is she depicted as European?) the whole Polynesian association with volcanoes and lava (the Pacific Isles are very volcanic) is a clever way of branding the game. Saying that, however, this game could still use more fiery imagery than it actually does. Perhaps have it take place inside a volcano? Without the title and logo, players would be underwhelmed by the rather generic ‘Easter Island'/Polynesian look which is on its way to being overused in the slot industry. At best, they would think this is a bad Aloha! Cluster Pays slot. The font could also do with some work. But despite all that, the theme is at least tolerable to play with. The game could have very easily included annoying, high-pitched characters and market them as ‘cute' in order to attract more players. This tactic always comes across as a cheap trick and nobody falls for it. The heavy drumbeat soundtrack helps a lot with this and makes playing the game better that it might have been. So with very minimal features, how can we talk about what this game has to offer? Well, we can describe the features that this game has in some detail but not immensely which will make this section much shorter than it usually is. However, we will try to remain positive in our analysis. The most interesting feature has to be the fireball wild symbols that feature throughout Blazing Goddess, but that isn't saying much. You can win up to 30 free games where these wild symbols will appear, so long as you match up all the volcano symbols along one row. They increase the multiplier by the multiplied bet. This is rather promising but ultimately underwhelming as it seems to be rather difficult to get these volcano symbols to match. We wish this weren't the case. And we're not entirely sure what the game means when it says '30 free games.' Does that mean extra spins? It could be clearer on the matter as this would doubtlessly confuse new players. The substitute symbols, depicting the fiery Goddess herself, fairs a little better. What this symbol does is help increase your win to double the amount you wagered. But it does not appear as much as it should do. However, it does act as rather good substitute symbol and certainly increases the likelihood of winning. It certainly plays into the more than 1,000 ways to win factor. Want to play Blazing Goddess? Blazing Goddess mobile slot blows away with the graphics and 1,024 ways to win! Claim bonus and extra spins now! Blazing Goddess Overall, we're fairly disappointed with this game and, we think, with good reason. With little to entice the player's appetite with very small and pretty insignificant features that only add to the 1,024 ways to win selling point of the game and even that is slightly difficult. The RTP, being at just over 95%, is rather low is is guaranteed to make you feel frustrated while playing as you feel like getting a win isn't as regular occurrence as it should be. We do praise the developer's vision for the theme of Blazing Goddess though: bold with an eye-catching logo and a pretty decent design overall, it isn't overly offensive and is likely to please you while looking at it. The soundtrack is also tolerable and enhances the Pacific Isle feel. We didn't want to be so negative with this game but it left us with little choice, sadly. In short, a wasted opportunity. It certainly is not as fiery as its title.